There is no need to take an appointment. Applicants can visit the Embassy/Consulate on any working day. For submission of documents : 9:15 am - 11:15 am. Delivery of documents : 11:30 am - 13:00 pm. The service will be on first come first serve basis. Before, approaching the Consular Office to seek required service, applicant must be ready with complete application form and other required documents, as mentioned in the Embassy website. This is important to render better and quick service to the applicants. The Embassy/Consulate reserves the right to reject attestation of documents, the contents of which are objectionable or contrary to the Rules. Police Clearance Certificate (PCC) will be issued only after confirmation of applicants Police Verification Records from the system. In the absence of confirmation through the system of Embassy/Consulate, matter will be referred to concerned authorities in India for clearance with a minimum time frame of 30 days. Applicants with foreign passports (other than Indian passport) applying for PCC may provide complete details of their stay in India, including date/month/year of their stay with complete residential/official addresses. Such cases will be processed only after obtaining clearances from authorities in India and may take more than 30 days for processing. Download the Miscellaneous Application form and fill it up carefully. 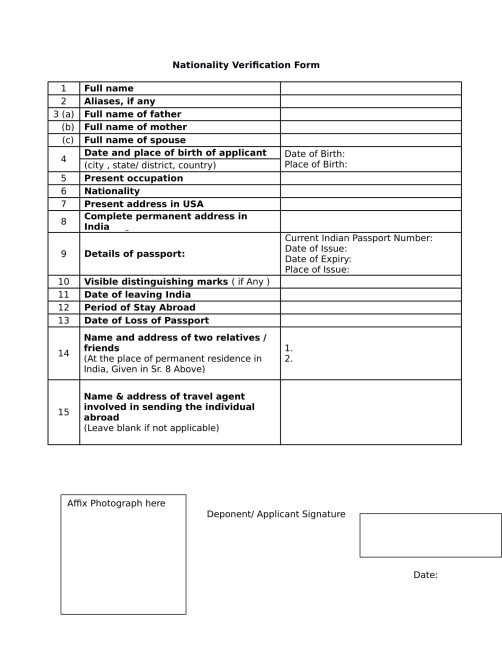 Each applicant is required to fill up separate Miscellaneous Application form and affix his/her photograph on the same. Applicant may fill up the Nationality Verification Form. Original and photocopy of any of the following documents as proof of residence: US Driving License, Utility Bill, Lease Agreement, State Identity Card, and Mortgage Deed. Note: Bank/credit card/mobile phone statements are not accepted as residence proof. Fee: A non-refundable fee of US$ 27/- (if the current passport is issued from the New York Consulate) and US$ 42/- (if the current passport is issued elsewhere) per attestation. The fee may be paid through cash only. Processing Time: Please refer the instructions given above. Self attested copy of the document showing valid US Visa Status. Fee: A non-refundable fee of US$ 27/- (if the current passport is issued from the New York Consulate) and US$ 42/- (if the current passport is issued elsewhere) per attestation. The fee may be paid through money order/cashiers’ cheque in favor of Consulate General of India, New York. Please send a track able pre-paid return mailing envelope to the Consulate General of India, New York, 3 ,East 64 Street New York 10065 ( between Madison and V Avenue (this is mandatory).